The New Paltz Regional Chamber of Commerce is proud to present its 8th Annual New Paltz Challenge! The 2017 edition will be held on Father’s Day,Sunday, June 18, 2017. Pick your challenge!Choose from a Half-Marathon, Family 5K, and/or kid’s 1-mile run.The half-marathon features an out-and-back course along the scenic Wallkill Valley Rail Trail, and offers runners a bucolic New Paltz landscape with sweeping views of the Shawangunk Ridge, the Wallkill River, and Historic Huguenot Street, a National Historic Landmark District. 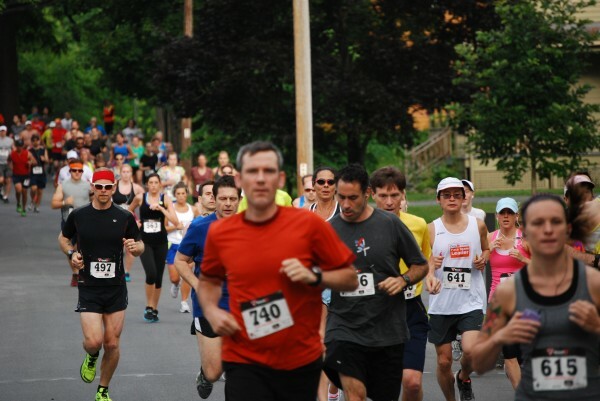 The 5k runs along Historic Huguenot Street and the Walkill Valley Rail Trail. Both the half-marathon & the 5K feature the following: * chip timing* water stops* first place in age group prizes* post-race refreshments* flat courses (ideal for PR’s) plus all half-marathon finishers will receive medals. The half-marathon will be timed in 5 year age groups and the 5K will be timed in 10 year age groups. Early bird registration for both races ends on Saturday, April 15, 2017. Half-marathon registration closes on Wednesday, June 14 2017and will be capped. The only true trail half marathon in the area, the out-and-back course leads runners along the scenic Wallkill Valley Rail Trail and through the bucolic New Paltz landscape with sweeping views of the Shawangunk Ridge, the Wallkill River, and Historic Huguenot Street, a National Historic Landmark District.